Uploaded 2/11/2014 Film / Memory Type . Very original and nice balance of colors. Congratulations on the award, Adam. Brilliant and stunning! Excellent work and very impressive presentation! NICE!! Fantastic idea, very well done. So well conceived and executed, Adam...An original and very appealing image...Congrats on your SC! woooow another great photo-work !!! Original and well deserved the award! Congratulations my friend. 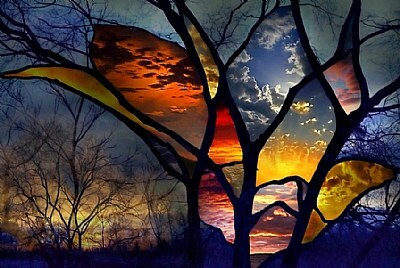 Impressive shape, colors and abstract scene, terrific captured, congratulation for deserved award, regards. Thank you so much Aleksander. Very nice Adam.... well deserving of the award. CONGRATULATIONS Adam, a well deserved award. This is a stunning composition with beautiful tones and all those wonderful cloud images caught up in the coloured glass segments. An excellent original idea beautifully executed. Best wishes my friend.